ZenBook Flip S is a timelessly elegant masterpiece, exquisitely crafted from solid aluminum. The chassis is forged from a single block of metal that’s carefully honed until it's a mere 10.9mm thin. Weighing just 1.1kg, it’s effortlessly portable. And because it’s made from premium, aerospace-grade aluminum, it’s lighter than standardlaptop alloy but 50% stronger. The NanoEdge multitouch display on ZenBook Flip S offers all the quality you'd expect from such a beautiful laptop. The ultra-sharp screen offers an amazing up to 4K UHD resolution of 3840 x 2160, and it features 178° wide-view technology — so imagery looks great from almost any angle. And with an incredible pixel density of 331ppi, images and text are always pin-sharp and ultra-detailed. To equip ZenBook Flip S with unsurpassed audio quality, the ASUS Golden Ear team and audiophile specialists at Harman Kardon joined forces to produce the next generation of ASUS SonicMaster audio technology. The results are astonishing. ZenBook Flip S features two separate high-quality speakers powered by a smart two-channel amplifier, to bring you true surround-sound that envelops you with distortion-free, cinema-quality realism. 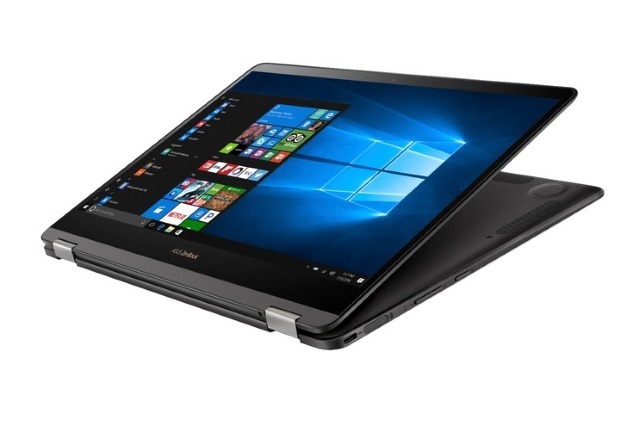 ZenBook Flip S really does give you the most incredible sound you’ve ever heard on a laptop. ZenBook Flip S includes an amazingly accurate fingerprint sensor with super-quick recognition. It’s one of our smallest ever laptop sensors, measuring just 16mm long and 3.6mm wide. It can even recognize a partial fingerprint scan, making it the perfect companion for instant one-touch login via Windows Hello. ZenBook Flip S includes all the accessories you need for a perfect mobile experience. A black leather sleeve keeps it safe from scratches, and an all-in-one USB-C™ Universal Dock gives you all the ports you need, including an SD card reader, LAN, VGA, HDMI, standard USB 3.0 and a USB-C™ port for charging. Connecting to all your devices at home or in the office is incredibly easy with ZenBook Flip S.